Over 3,000 filled Fellowship Chapel in Detroit to hear Min. Farrakhan on May 17. 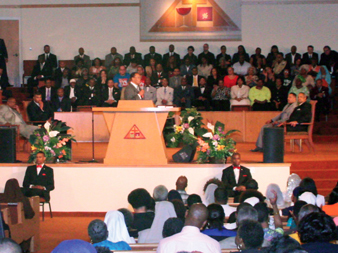 Over 3,000 heard the Honorable Minister Louis Farrakhan live May 17 at Fellowship Chapel in Detroit, Michigan. 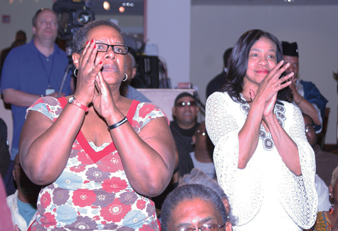 Among those in attendance was long-time Congressman John Conyers who said he enjoyed the Minister’s vision and motivational message to the community. “This was a historic occasion in terms of how we pick ourselves up, dust ourselves off and really start putting the city and our minds together for moving forward,” said Rep. Conyers. Davi Trusty of the Idle No More indigenous revolution said what he heard from the Minister was exactly what is needed. “It’s what we’re talking about from economics security, doing for self, Monsanto—the GMOs—and how it’s poisoning our people,” said Mr. Trusty. “I think now is the time that we really need to focus on the family that is the Nation of Islam. It’s high time we stop pretending that we’re separate. We’re the same family, I just look this way and you look that way but we come from the same family. We know that now and I think his message resonates with us so hard it’s because it’s the truth and our mind is built for truth,” he added. Latonya Hudson used to live in Detroit, however, the crime became too much for her to bear and she feared for the safety of her small children. She was encouraged by the Minster’s message but wasn’t yet ready to move back. “The Honorable Minister Louis Farrakhan gave us a recipe of how we can not only resurrect and revive our communities but also how we can forge forward in unity as a people and develop and secure a bright and prosperous future,” said Student Minister Marcus Muhammad of Benton Harbor, Michigan. Amena Walker said the Minister’s appearance was timely and said, “as usual, he told the truth,” and that residents have to look to look within to find what is needed to solve the city’s problems. State Representative Fred Durhal, also a candidate for Detroit mayor said his message was needed. “I think the message about Detroiters being able to control their own destiny was right on. We needed to hear that and we needed to also understand and hear from the Minister that there is great hope and that Detroit is not dead,” Rep. Durhal said. “We’ve been down before but that doesn’t mean that we’re out of the game. We’re coming back. Detroit is going to be stronger than it has ever been in its history and Black people are going to be in charge of this city,” he added. Longtime Detroit activist Malik Shabazz of the New Marcus Garvey Movement and The Black Panther Nation said the “army of God” is being formed. “The Minister ripped it. What can you say? He is the man of this day. He is the man of God. I’m ready to follow and heed the message and to add in the component that he’s talking about, about us buying Detroit in my ministry and my street soldiering,” said Mr. Shabazz. “It’s time, it’s in season and we’ve hit our low point. We have been taken over. We have to unite and do for self, come together or we die and I think we are beginning to over-stand that. The man of God was in the house tonight to wake us up,” he added. Student Minister Troy Muhammad was very happy with the wide cross-section of community leadership that turned out to hear the Minister’s divine and timely guidance. He summed up the entire two-day trip by saying. “The spirit of God came to Detroit,” adding that everyone who heard the Minister’s voice will be transformed and will operate with a new mindset.